Shady Side Academy, Fox Chapel. Main-stage shows: $20-75; Night Caps: $10; Fringe Fest is free. Opera Theater of Pittsburgh occupies what might seem an unlikely headquarters: the third floor of Lawrenceville's Stephen Foster Community Center, a hulking old brick building owned by the Catholic Youth Association. The ground floor houses a senior center and the second level is a day care. So while sopranos and tenors rehearse upstairs, toddlers scale the jungle gym and white-haired gents step outside to bemoan the humidity. Opera Theater embraces both sets of neighbors. The day care is one site for the company's pre-K education program, Opera for Tots. And at the senior center, says Opera Theater artistic and general director Jonathan Eaton, "We do lunchtime recitals for them. They help us stuff envelopes." The company (which is distinct from the much larger Pittsburgh Opera) moved to Lawrenceville from Oakland seven years ago, for better parking, more space and lower rent. But Opera Theater's home in the heart of the city also echoes its mission to make opera more accessible. Now Eaton is pursuing that goal with an ambitious leap. This year, the 35-year-old company shucked its traditional season to reinvent itself as SummerFest. It's two weeks of fully produced but modestly scaled classics and new work, both mainstage shows and less-formal performances. It's all on Shady Side Academy's leafy Fox Chapel campus, and comes complete with ice cream and hamburgers. The festival fills a regional arts niche: "This is the only major city in America with a major symphony orchestra that has no summer festival associated with classical music," says Eaton, seated in his Foster Center office, his back to an old upright piano. 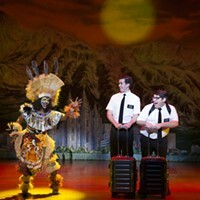 But to Eaton, it's not just about staging all the company's shows in two weeks, instead of spreading them out over the year (a huge logistical challenge for the once modestly staffed company). It's also about repackaging an art form long typecast as snooty. "We do try to contest the impression that opera is for a select few," he says. At first glance, SummerFest's three full-length shows (with four performances each) diverge little from Opera Theater's usual fare. But Eaton says these classics were selected for summer-festival compatibility. Mozart's The Magic Flute is a sportive comedy — and like every SummerFest production, it's sung in English, a deliberate bow to accessibility. ("To sing the opera in foreign languages all the time can tend to alienate people," he says.) And Candide, Leonard Bernstein's adaption of Voltaire's satire, is a colorful, lively, even whimsical show that's as much musical theater as opera. But perhaps most notably, Bizet's Carmen has been reworked by Eaton and composer Robert Frankenberry: Nodding to the culture of its title character, this is the premiere of their flamenco-accented Carmen — The Gypsy. It's set in a bar, its traditional chorus eliminated and the music played by an onstage combo including guitar, piano, double bass and accordion. 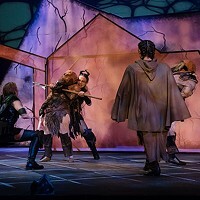 Also in the Kountz Theater is Night Caps, a series of six brand-new commissioned comic mini-operas aimed at the young-professional crowd. Based on an idea by Eaton, playwright Robert Handel — who heads Carnegie Mellon's dramatic-writing program — wrote what he calls the "slightly risqué" book for these one-acts. Each is set in a hotel room, with characters ranging from newlyweds to a U.S. president. The music is by six different composers; Pittsburgh's Eric Moe, for instance, handled "Valkyrie Suite," which parodies a famous scene from Wagner ... with a women's bowling team. 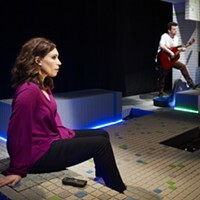 Each 15-minute Night Cap follows a main-stage performance; the $10 ticket includes a glass of wine. "It's witty, it's wicked, it's a little naughty. Leave the kids at home," says Eaton. All six Night Caps will be staged together on July 15. SummerFest also includes nightly Cabaret Under the Stars performances on an outdoor patio: lighthearted Broadway and operetta tunes, sung by students in Opera Theater's Young Artists Program. Meanwhile, Mozart Camp is an immersive five-day session for adults, with talks by Mozart experts, concerts and more. (The four concerts are open to non-campers.) And for free, you can picnic on the Hillman lawn (with optional access to an on-site caterer) or bring the kids to SummerFest Fringe, a family-friendly weekend offering of activities and performances. The Hillman Center is just a 20-minute drive from Downtown. With the wine, the picnics and the late-night programming, "It's a social event as well as an artistic event," he explains. The Fringe festivities exemplify that: "The arts," Eaton says, "need to be part of the community."